ULTIMATE LUCK "DOUBLE BUDDHA" pendant. This hard to find pendant is made from SOLID, "LEAD FREE" PEWTER and comes READY TO WEAR with a FREE 30 inch black neck cord. The DOUBLE BUDDHA and the neck cord are both designed to last a lifetime. The DOUBLE BUDDHA ultimate luck pendant also comes with SECRET INSTRUCTIONS - secret words to speak that are believed to "ACTIVATE" it's luck drawing power. Sold as a novelty and CURIO ONLY, as we can not and do not make any claims of SUPERNATURAL POWERS, but if you don't simply LOVE IT, send it back for a full refund - no questions asked! FREE SHIPPING in the USA only. Outside, USA, shipping is $5. THANKS for looking!! NOTE: I only received a SMALL HANDFUL of these rare Double Buddha pendants from a dealer at a trade show some time ago, and when they are gone, THEY ARE GONE FOREVER!! don't miss out! 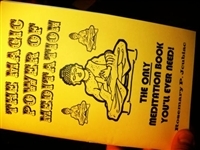 MANTRAS BEGINNING WITH “AUM” OR “OM"
Copyright 2011, 48 Pages, BRAND NEW, Softcover!!!!!!!!! SAFE, HIGHEST QUALITY "LEAD FREE" PEWTER !!! 2 SIDED PENDANT - MADE TO LAST A LIFETIME! KEEP FOREVER - PASS DOWN FOR GENERATIONS AS AN HEIRLOOM! SOLID PEWTER - NOT PLATED! DON'T BE FOOLED BY IMITATIONS! The LEGENDARY, ANCIENT "Abracadabra" good luck symbol, rumored to have been worn by the luckiest people in history that knew of it's secret power! The legendary magical word is specially written in it's language of origin and adorned with sun, moon and stars (symbolic of the bearer having all of this at his command!!) This seal is cast in SOLID, HIGH QUALITY "LEAD FREE" PEWTER and is designed to last a LIFETIME! Comes complete and "READY TO WEAR" with a free 30 inch nylon neck cord, ALSO designed to last an entire lifetime! 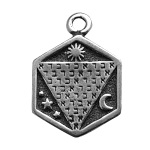 DIRECTIONS: Simply slip this powerful talisman around your neck and wear it secretly under your clothes! Unconditionally guaranteed, if you don't love it, just send it back for a full refund, no questions asked!